Our Seychelles volunteer project focuses on three key aspects: Endangered Species monitoring, Marine Conservation and Ecosystem Restoration. For a unique ecotourism experience which allows you to give something back by supporting a dedicated conservation research and volunteer team on a private tropical island paradise, come and support those volunteering in the Seychelles. Ecotourists live and experience land and marine conservation life on the exclusive North Island in the Seychelles – considered by many to be the most beautiful archipelago in the world with its luminous white beaches, granite outcrops and azure oceans. 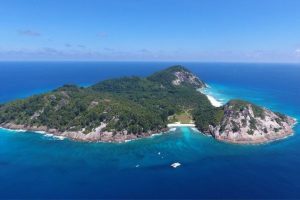 This unique island and marine conservation experience allows you to accompany scientists and Seychelles volunteers while focusing on Endangered Species Monitoring, Marine Conservation and Ecosystem Restoration. The project seeks those with a keen interest in tropical island conservation and ecology. No more than 4 participants join a dedicated conservation and research team on a private island and get involved in all the activities of the Environmental Department and conservation volunteers – from field work to data entry. North Island represents a Noah’s Ark – a sanctuary where natural habitats are being rehabilitated and where critically endangered Seychelles fauna and flora are being reintroduced by conservationists and volunteers – providing a haven to regenerate. It is very seldom that the opportunity arises to make such a significant and positive impact on a region, a specific area, its wildlife and surrounding environment. North Island was recognized for its island and marine conservation work by being awarded as the National Geographic World Legacy Awards winner for Conserving the Natural World 2017. Activities include morning beach patrols to search for evidence of nesting sea turtles, assisting with the removal of coconut saplings and other invasive species, planting indigenous/endemic plants, collecting seeds, monitoring the White Eye population, Giant Aldabra Tortoise population and Hawksbill Sea Turtle population, taking care of babies if necessary, Terrapin trapping, and conducting snorkeling photo surveys in support of marine conservation. While conducting these activities with research staff and volunteers, participants gain a better understanding of the environment and the challenges faced by island conservation initiatives around the world. Seychelles conservation ecotourists can expect to be active 6 days a week with a rest day on Fridays. You will stay in a traditional 2 bedroom stone cottage between the palm trees and close to the beach. There are plenty of opportunities to mix with and learn from the full-time staff and volunteers after-hours as well as partake in fun activities such as swimming, scuba-diving, surfing, enjoying sun-downers, paddle-boarding or kayaking – all available every day after 4pm at the dedicated staff beach. Or you may choose to explore more of the Seychelles between island and marine conservation activities on this beautiful private island! CJ is in charge of the Environmental Department on North Island and oversees the running of all departmental activities. Tarryn is the Seychelles Conservation Coordinator of North Island and together with CJ Havemann (who happens to be her husband), carefully plans the implementation of the Island’s conservation priorities and future initiatives. CJ and Tarryn both completed the field-work components of their MSc’s in a Wilderness Safaris concession of Botswana, and came to understand and respect Wilderness Safaris’ ideology and commitment to low-impact ecotourism around the world. Elliot Mokhobo is an integral part of the Environmental team and has more than 12 years of experience on North Island. He was part of the original construction team who built the lodge on North Island and decided to stay on the island after construction had been completed. He first joined the Maintenance department before moving to the Environment department in 2006. His many years of experience on North Island means he has seen all of the island’s land and marine conservation projects at work and therefore has a wealth of knowledge of the island. North Island in the Seychelles is a tropical island paradise - a rare sanctuary for those seeking land and marine conservation activities a gorgeous, unspoiled tropical haven. More importantly it is a Noah’s Ark: a sanctuary where natural habitats are being rehabilitated and where critically endangered Seychelles fauna and flora are being reintroduced and given a place to regenerate. It is very seldom that the opportunity arises to make such a significant and positive impact on a region, a specific area, its wildlife and surrounding environment. We seek participants with a keen interest in tropical island conservation, marine conservation and ecology. Participants on our North Island project need to be quick learners and able to remain independent in the field after only a few days induction. At certain times of the year be prepared for high temperatures of 28 – 32o C, with high humidity. You must be in good physical condition and able to walk up to 5km per day on deep sands and hilly terrain, and have a good sense of observing animals and birds. Participants should be self-disciplined, responsible, enthusiastic, patient and able to get along well with others. Marking and monitoring of Green (Chelonia midas) and Hawksbill Sea Turtle (Eretmochelys imbricata) populations. Rehabilitation of the endemic vegetation of North Island, particularly the Takamaka forest. The assigned staff beach on North Island provides the perfect opportunity to go swimming, snorkeling or even a sun-downer after work in the afternoons. North Island equipment such as surfboards, paddle-boards and kayaks are available for use every day after 4pm, so there are plenty of opportunities to have fun! Participants can expect to be active 6 days a week, with a rest day on Fridays. You can either choose to spend your rest day on North Island, relaxing at the staff beach, or you can accumulate your rest days to leave the island for a period of 3 days to visit other islands. This way you can explore the Seychelles while you contribute towards island and marine conservation, on a beautiful private island! You will be required to wear the official island conservation uniform at all time, which will be provided to you on arrival. While the staff uniforms may not be particularly flattering or perfectly-fitting, they are functional, and it will be compulsory to wear them at all times while working and moving around the island. Please note that you will also not be able to eat in the guest restaurant. 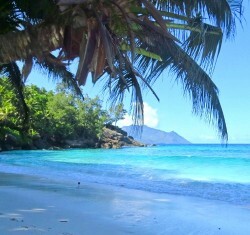 Seychelles is an ideal destination all year-round, as it is always warm and does not reach extremes of heat or cold. The temperature rarely drops below 24°C or rises above 32°C. It is generally cooler when the north-west trade winds blow during the months of November to March. The sea is generally calm and the weather warm and humid, with average winds of 15 – 22 kilometers per hour. A larger amount of the annual rainfall falls during the months of December to February, compared to other months. This generally occurs in short bursts rather than prolonged rain. It is also fairly cloudy at times during those months. The weather is hottest from December to April, and the humidity is high – often 80% or higher. The months of May to October bring drier, cooler weather, and livelier seas and winds of 19 -37 kilometers per hour are common. Participants will live in a shared-accommodation house and will have opportunities to mix with conservation staff after hours, if they so choose. Participants will be accommodated in twin rooms (i.e. two single beds per room). The house consists of 2 bedrooms, 1 lounge and 1 bathroom. This means that ecotourists will have to share a bathroom among 4 people, (which sometimes will be 2 male and 2 female participants). The house is not air-conditioned, but there are standing fans in each bedroom. As a tropical island, there will of course be insects including mosquitoes, spiders, beetles, etc. They may occasionally come into the house as well. Seychelles ecotourists need to take responsibility for cleaning the house (whether it is daily or weekly). Participants eat together in staff canteen – all meals provided (3 basic meals a day). Four times a week before dinner (on a Monday, Tuesday, Thursday & Saturday), participants will be able to purchase snacks (soft drinks, sweets and beer) from the staff shop. There is clean drinking water available on the island – bring 2 water bottles with you, which you can fill whenever you need to, in the canteen or at the research office. *Vegetarians do need to bring supplements to add to their meals to ensure a balanced diet – the island does not cater well for vegetarians or vegans. Supplements could include nuts, snack bars or any other snacks which have high protein content, or a protein shake. WiFi is available in the Environment Office all the time; the staff use it for work and it is not password protected, so participants are welcome to use it. We merely ask that participants do not abuse it by downloading movies, being on Facebook all the time etc. There is mobile phone coverage on North Island – Cable & Wireless. This is the only Seychelles provider which works on North Island. The North Island ferry will collect you from the Mahe Harbour at 08:00 on a Monday morning. This means that you either need to book a flight that arrives very early on Monday morning, or one that arrives on the Sunday (or on Saturday if you prefer) before your ferry trip to North Island. We will send you a list of guest houses to stay at should you need it. On your Monday of departure, the ferry will pick you up from North Island at 15:00, and drop you off at Mahe Harbour at around 16:00 to 16:30. You can therefore choose a flight departing Mahe either that Monday evening or the following morning. IF you can’t find a suitable flight on the scheduled departure Monday, you can choose to leave early on either the Friday or Saturday – again the ferry will pick you up from North Island at 15:00 and dock at Mahe Harbour at around 16:00 or 16:30. There is no transfer fee charge for you ferry ride between Mahe and North Island. Eco-tourists will only be required to catch and pay for a bus or taxi from the airport or guesthouse to the Mahe Harbour. Buses and Taxis are very reasonable in the Seychelles and won’t break the bank. If you wish to join our Seychelles conservation project after joining any of our other projects in Africa, you will not be charged the normal additional transfer fee. So for example, if you join us in Zululand for our Endangered Species Conservation project, you will need to depart Zululand on the Sunday instead of the normal rotation which takes place every second Monday. A special transfer will therefore be organized for you on the Sunday in order for you to arrive in the Seychelles on the Sunday – ready to catch the ferry the next Monday. Please download a Seychelles Project brochure for more information regarding visas, vaccinations, flights transport and what you’ll need.